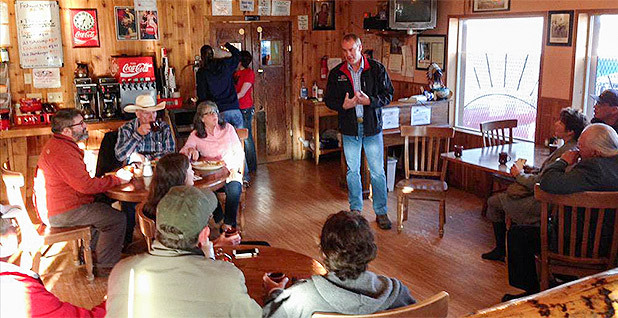 Montana Rep. Ryan Zinke (R) at a town hall meeting in Browning, Mont. President-elect Donald Trump has nominated Zinke to serve as the secretary of the Interior. Photo courtesy of @RepRyanZinke via Twitter. Rep. Ryan Zinke (R-Mont.) took thousands of dollars in campaign donations from companies that drill for oil and gas on the vast public lands that he would oversee as Interior secretary. Watchdog groups say the contributions, totaling $345,000 since 2013, raise questions about whether the fossil fuel industry could influence a Cabinet secretary who controls drilling, mining and conservation policies across more than 500 million acres of public land. Zinke's top individual campaign donor is Taylor Reid, president and chief operating officer of a Texas-based oil and gas company that drills in the Bakken oil field. Reid, who has been with Oasis Petroleum since its founding in 2007, donated $11,600 to Zinke's election efforts between 2013 and 2016, an analysis of Federal Election Commission data shows. During that time, Zinke won Montana's single congressional seat, in 2014, and was re-elected in November. President-elect Donald Trump tapped the 55-year-old former Navy SEAL last month to head the Interior Department, a sprawling federal agency responsible for policies that dictate drilling, mining and protection of about one-fifth of the land in the United States. Reid is one of 10 executives at Oasis Petroleum who collectively donated $41,750 to Zinke over the last four years, an E&E News analysis found. Thomas Nusz, president of the company and one of its directors, was another top donor, kicking in $10,600 to Zinke's campaigns. Oasis has interests in about 50,000 acres of public land, a little under 10 percent of the company's full holdings, which cover about 540,000 acres in the North Dakota and Montana regions of the Williston Basin, a spokesman for the company said. The region includes the oil-rich Bakken and Three Forks formations. Reid and Nusz could not be reached for comment. Experts say the ethics rules governing individuals entering the executive branch don't require Zinke, or any other Cabinet nominee, to disclose campaign contributions. But while it may not be a legal conflict of interest, Brendan Fischer, associate counsel of the Campaign Legal Center, a money-in-politics watchdog, said human nature might make it an unofficial one. "If the companies that funded your political career up to this point have interests before you in a new capacity, I think it's reasonable to infer that past financial support is going to present a current conflict," he said. "The public is right to question whether decisions he makes as Interior secretary will be in the public's best interest or in the best interests of his past donors." Spokespeople for Zinke and the Trump transition team did not respond to multiple requests for comment. Retired folks and Republican individuals and groups were the top two donor groups to the congressman, who has raised about $10.1 million since 2013. Energy interests came in third. FEC data show Oasis' support represents a fraction of the money given by the energy industry. In 2015-16, energy and natural resources political action committees contributed $126,000 to Zinke's campaign, according to OpenSecrets.org. That includes $3,000 from the Halliburton Company PAC, $5,000 from both the ExxonMobil PAC and Conoco Phillips, $2,500 from the Koch Industries Inc. PAC and $1,000 from the Peabody Energy PAC. All of them represent companies that do business with the Interior Department. Over the course of Trump's campaign, the president-elect has repeatedly said he intends to open up federal lands for increased fossil fuel development. As Zinke heads into his confirmation hearing Tuesday in front of the Senate Energy and Natural Resources Committee, questions will likely arise as to how closely the fifth-generation Montanan and self-proclaimed "Teddy Roosevelt" Republican tracks with his boss. Randi Spivak, public lands program director with the Center for Biological Diversity, said Zinke's voting record in Congress illustrates that he is already beholden to energy industry interests. The League of Conservation Voters gives Zinke a 3 percent lifetime score on environmental issues. "The fact is he has taken these donations from companies, and we've seen what he's done in Congress to advance their agenda," Spivak said. Although Zinke has come out strongly against selling public lands and in support of the Land and Water Conservation Fund, he has also voted to block federal coal reform and came out in favor of the Keystone XL pipeline. He also opposes Interior regulations to limit methane waste from oil and gas wells. Spivak is especially concerned about the level of political support Zinke has received from the coal industry. Interior owns and manages about 40 percent of U.S. coal reserves, largely in the Powder River Basin. Under President Obama, the agency has undertaken a full review of the federal coal program and paused new leasing for three years. Trump has vowed to undo the review and moratorium within his first 100 days in office. Coal giants Arch Coal Inc., Alpha Natural Resources Inc., Cloud Peak Energy Inc. and Peabody Energy Corp. have all given to Zinke. BNSF Railway Co., a large player in transporting coal from the Powder River Basin, has given the congressman $14,000 since 2013. "This is a bright red flag for Zinke," Spivak said. "Fossil fuel and coal interests loom large." Campaign contributions are a form of lawful political speech, said Kathleen Sgamma, president of the Western Energy Alliance, an oil and gas trade association. "People give because they have political convictions or they have a cause, whether that's an environmental cause or business one, and that is reasonable," she said. "That's not suggesting quid pro quo or expecting certain actions in return." Sara Rinfret, an assistant professor of political science at the University of Montana, said Zinke will likely draw inspiration from far beyond his donor list. Zinke will also take over a bureaucracy with 70,000 employees. Those boots on the ground largely carry out the missions of the agencies housed under Interior. Some, like the National Park Service, are heavily conservationist in nature. "Granted, he's getting contributions from oil and gas, he supports energy development, especially coal development and clean coal, and I think that's going to be at the forefront, but I think he's going to consider other options, too," Rinfret said. She cautioned against drawing too many conclusions from his campaign contributions and said a better measure of what to expect from Zinke could be found in his legislative record. It's also highly unlikely, she said, that donors could have guessed Zinke was going to be Trump's pick for the top Interior job. Still, she said, it's important to watch if Zinke pursues policies that are in line with the agency's mission and not donor interests. "There's a difference between being an elected member of Congress and then being a political appointee," Rinfret said. From a legal perspective, there is little, if anything, Zinke must do to head off perceived conflicts of interest stemming from his campaign contributions, said Fischer, with the Campaign Legal Center. He said he hopes Zinke is asked during his confirmation hearing to address the contributions made by Oasis Petroleum and other energy companies that do business with the Interior Department. He said it would be "honorable" for Zinke to recuse himself from decisions that directly benefit his political donors, or explain why that isn't necessary. "At a minimum, he should be asked to address it," Fischer said.